Surya Namaskar A, or Sun Salutation A, is a sequence of movements done in yoga that are linked with breath. Performing this sequence of poses requires strength and stamina, but also a sense of mental calm and focus to remain steady as things get a little more challenging. According to the International Journal of Health Sciences and Research, performing Surya Namaskar A has been proven to increase hamstring flexibility, improve upper body muscle endurance and also helps to reduce blood pressure. In another study from the Touro College of Medicine published in a 2011 issue of the Journal of Bodywork and Movement Therapies, Surya A as it is often called, also has cardiovascular benefits. In this one-day yoga medical study to investigate the cardiovascular benefits of Surya A, the participants completed a single yoga class of about 30 minutes consisting of only four rounds of this asana series and resting poses. The researchers attached a heart rate monitor to each participant to measure cardiovascular changes during the activity. The results of the study show there are real cardiovascular benefits from doing Surya Namaskar. By round two of Surya A, the participants had reached 80 percent of their age-predicted maximum heart rate (or HRmax). During round three of Surya Namaskar A, the participants reached 84 percent of HRmax, and reached 90 percent of HRmax during round four. On average, the participants achieved 80 percent of HRmax! 1. Stand in Tadasana, or Mountain Pose, at the top of your yoga mat. With your hands firmly pressed together at your heart space, invite full, deep breaths. When you feel ready, inhale and lower the arms down, around and up overhead to Upward Mountain, or Urdhva Hastasana. You can press the palms together so long as it doesn’t crunch the shoulders. Keep your tailbone long toward your heels, with your hip points working up toward your chest. As well, don’t grip the floor with your toes! 2. Next, on an exhalation, fold forward—hinging at your hip creases to Uttanasana. In this forward fold, keep your shoulders lifted away from your ears. Try to keep your spine long as well, so there isn’t a lot of rounding in the upper back. 3. Lengthen your spine on an inhale and gaze forward (with hands either on your shins or on the floor) to half lengthen, or Ardha Uttanasana pose. In this pose, feel as though your ribs could move or lengthen off of your hips. Don’t let your arms dangle, as this is strenuous on the lower back. 4. Now plant your palms on the mat and step back to plank. On an exhalation, lower through to your Chaturanga Dandasana. To review how to perform this pose, read my article that focuses on Chaturanga in an earlier series on FitnessRx. Basically, you are lowering down with the elbows firming in toward your side body—not letting your elbows fall out to the sides. Keep your shoulders back and gaze beyond your mat. If you feel like your belly is pulling you down, bend your knees to lower until you gain more abdominal strength. 5. On an inhale, come into the backbend Upward Facing Dog (Urdhva Mukha Svanasana) OR cobra pose (Bhujangasana), being sure to engage your navel to your spine. To perform Upward Dog, keep your thighs lifted off the yoga mat. Draw the shoulders back and feel the space more in the middle back (thoracic spine.) To perform Cobra, which is a bit easier, take your Chaturanga to your belly and keep the thighs on the yoga mat. Slide your hands back a bit in line with your ribs and curl the heart and chest back. 6. On an exhale, come to Downward Facing Dog and rest for three breaths. 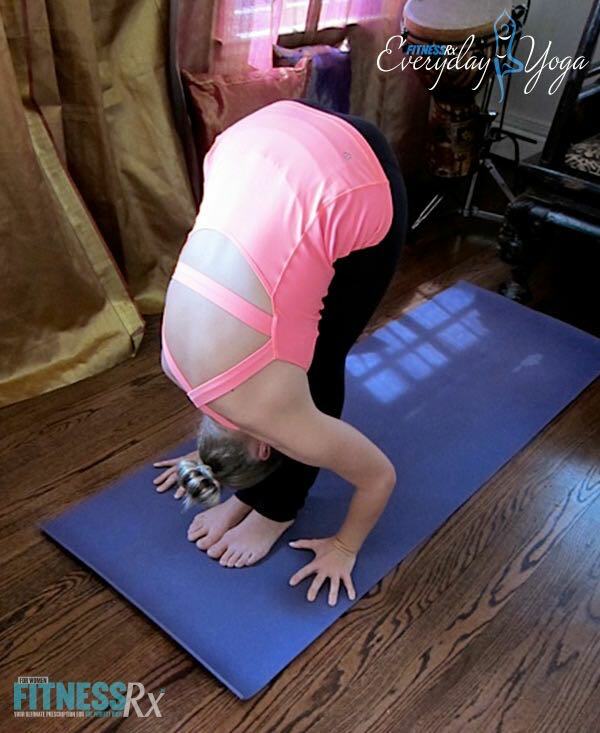 Downward Dog should look like an inverted “V” shape. Keep your belly and ribs in, with your ears in line with our upper arms—not collapsing your chest through your arms. Work your heels down to the floor gently. 7. Once you have completed three breaths, gaze to your hands and step or jump to the top of the mat. 8. Inhale and, once again, lengthen your spine to Ardha Uttanasana. 9. Exhale and fold forward to Uttanasana. 10. Inhale your arms around and up to Upward Mountain Pose, and then exhale back to Tadasana. Now, you have completed one round of Surya A! Try to build to at least three of four rounds every day, and you will soon start to see increased strength and health benefits. Stronger feet, legs, tummy, back; more spaciousness and endurance in your shoulder strength and arms. Be mindful that you are moving with your breath, and not holding the breath in. The breaths should sound oceany…in through your nose, out through your nose. Sara took her first yoga class as an 18 year old college student in Boston, Massachusetts. She fell in love with yoga and began practicing daily. By the time she graduated from Boston University in 2003, Sara had already completed her 200-hour Hatha Yoga certification and begun focusing her practice and teaching in the Ashtanga Vinyasa tradition under the tutelage of David Swenson. In 2005, Sara made her first trip to Mysore, India to study under Guru Sri K. Pattabhi Jois and deepen her connection to the Ashtanga Yoga lineage. She continues to make annual trips there, furthering her practice with R. Sharath Jois, Guruji’s grandson whom has guided the tradition since his grandfather’s death in 2009. While in India, Sara studies chanting with Dr. M.A. Jayashree, PhD and Sri Lakshmish. In New York, Sara remains connected to the tradition as a student of senior teacher Eddie Stern. She humbly dedicates her practice and teaching to her late Guru, Sri K. Pattabhi Jois and his family. Lana Russo is a RYT (Registered Yoga Teacher) 500. She is a three-time lululemon athletica Yoga Ambassador and has appeared in the yoga book and dvd series, Anatomy of Fitness: Yoga, available on Amazon. She is a popular teacher in Long Island, New York. Oh, My Aching Back and Neck! Is Hot Yoga Good For Your Health?